The actor who so memorably personified anguish as an abused young drummer in Whiplash, now finds himself in an equally uncomfortable place in Jason Hall’s directorial debut about American soldiers trying to cope with post-traumatic stress disorder (PTSD) after a tour of duty in Iraq. Miles Teller plays Adam Schumann, a once-confident sergeant who specialised in sniffing out hidden bombs on the war-torn streets of Baghdad. Once home, he finds it difficult to exorcise his combat demons, particularly his guilt over the devastating injury of a friend for which he blames himself. His two best friends, Solo (Beulah Koale) and Will (Joe Cole), also struggle to overcome various problems that threaten to unhinge them. PTSD is a problem that only began to be recognised during World War 2, and there has been no shortage of movies on the subject since then. But what distinguishes this film, adapted from David Finkel’s 2013 non-fiction account of soldiers returning from war, is how quietly realistic the movie is. Hall, who wrote the screenplay for Clint Eastwood’s very different American Sniper, is determined to remain true to the real feelings and experiences of his subjects. As a result we never sense we are viewing actors playing soldiers, or that a Hollywood plotline is overwhelming a more nuanced reality. What we do see very clearly is that America is largely incapable of handling the special needs of people who have experienced levels of trauma that ordinary folks back home can barely comprehend. 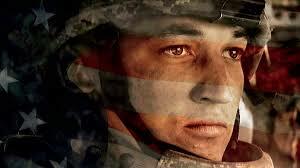 The scenes that detail the wholly inadequate counselling available for returning soldiers are numbingly powerful. Although Teller dominates the film as Adam, he receives excellent support from Koale, in particular, as well as Haley Bennett as Saskia, his loving wife who struggles to get through to him. In its quiet, relatively unshowy way, this ironically titled movie offers an important insight into a country that can barely rouse itself to care about men who fight overseas wars in its name.